Why Tune-Up? | Mediterra - Swim & Run Better Than Ever! What is a Tune-Up? And why should you add one to your swim practice? Traditionally, in individual sports like running and swimming, we have used the term “warm-up” for that part of the practice we do at the very beginning. The word ‘warm’ immediately gives us an idea of what that time should accomplish. We should feel warm and loose and limber, ready for action – not cold, tight and tense. It implies something about getting the heart rate up, preparing the energy systems to support our exertion. The term ‘warm-up’ fits well with the metabolic paradigm for training. Get the engine warmed up. Get the muscles and joints warmed up so blood is flowing and tissues will be less likely to get strained or tear. Coach Terry has been using a new term for this time – he calls it the ‘tune-up’. This term paints a different picture. We might imagine a musician tuning his cello. We might imagine a mechanic tuning your car. This term helps us take in a more detailed view of what the body needs to do to prepare for practice. We are not merely trying to get energy ready to flow, but to get energy ready to flow precisely where it needs to go and in what quantity. It’s not merely about being ready to exert myself, it is about being ready to focus my mind and control my body and make it go where I intend and how I intend. 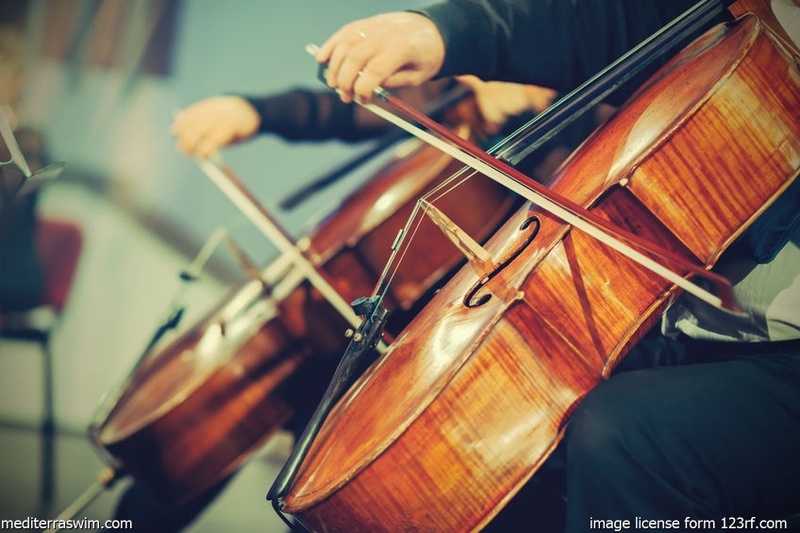 If a musician starts to play his cello without the strings in tune, he can exert as much force as he likes and hit the strings as rhythmically as he is able, but the sound will just not come out right. A driver may apply just as much force to the acceleration pedal and shift the gears perfectly, but without a well-tuned engine that vehicle will waste a lot of fuel, wear excessively on engine parts, and simply not perform as it should. For a swimmer, the ‘tune-up’ does include ‘warm-up’ but without having to focus on it directly. The brain’s job is to manage information and energy. The tune-up is about getting your brain ready to focus on the fine details of swimming: to read information inside the body and outside and to direct energy as it is needed. While you are doing this, the heart rate will rise, the body fluids will start circulating, the joints and tissues will respond and loosen up. But we absolutely must get that control center – the brain – on line and ready to do its best work in this particular activity- every time. What do you want to accomplish today? What details in the stroke will you need to keep careful watch over in order to accomplish your goals for today? What feedback will your brain need to concentrate on inside your body? What feedback will your brain need to concentrate on outside your body? What measurements will you be taking? How will you decide whether to increase or decrease the complexity of the current challenge? How will you know when to stop a particular set because it is no longer accomplishing what you need it to? This is what the tune-up is meant to get you ready for. You have now set the table. It is time to serve the meal! You were able to show the pitfalls of getting into training before a complete tune up, and then finished us off with the differnce between a tune up and a warm up. How about an example of how to tune up either for yourself or a general swim warm… uh I mean tune up! Well, you are right. I gave the concept but not a clear example.